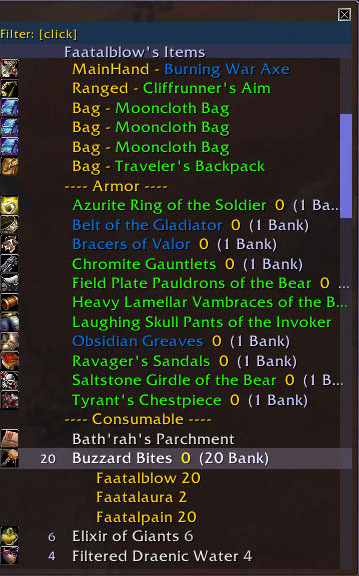 The warehouse lets you keep track of all the items your characters have on them and in the bank. 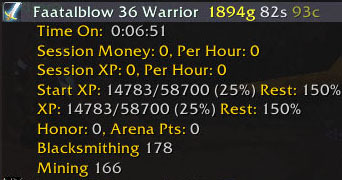 It also records various stats about your characters like when they were last played, how much money they have, honor and professions. The filter lets you search every character for an item. Open the Warehouse by left clicking the chest icon on the map or setting a key binding for "Toggle Warehouse". The left side of the window is a list of all characters that you have logged on with. 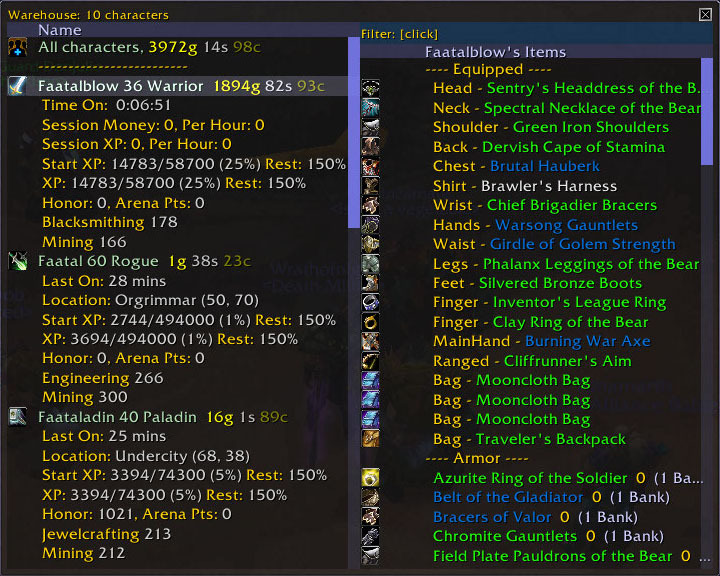 Left click a name to see the items for that character or "All characters" to see a combined list of items for all. Right click for a popup menu that lets you remove an old character from the list. The right side of the window is a list of items for the currently selected character. Equipped items are listed first. Other items follow grouped by category. The number in front of an item name shows the total number that the current character or all characters has of it. It will be blank if the count is one. The numbers after the name are the amounts in inventory and bank. The bank must be opened once for each character for CARBONITE to record what it contains. Right click the list for a popup menu that allows you to turn off the categories. Left click on an item to expand it. It will add the names and total count of any characters with the item. Clicking these names will hide them. Left click the "Filter:" at the top of the list to type in a name to search for. Press the ecape key while the filter is selected to clear it. CARBONITE® is a registered trademark of Carbon Based Creations, LLC. “World of Warcraftt® and “WOW” are trademarks owned by Blizzard Entertainment, Inc. This Website and the CARBONITE® Addon are not endorsed by or affiliated with Blizzard Entertainment, Inc. The CARBONITE® Addon is not affiliated with or sponsored by Carbonite, Inc. or its CARBONITE® on-line computer back-up software and service.